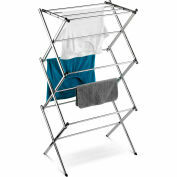 Honey-Can-Do DRY-01104 2-tier Mesh Top Drying Rack, Silver with Blue. 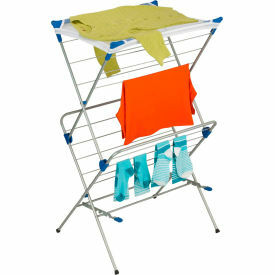 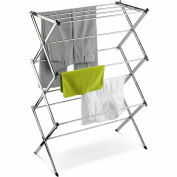 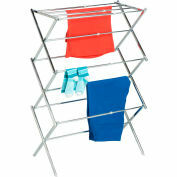 Dry your clothes without an energy consuming dryer even on rainy days with this handy 2-tiered drying rack. 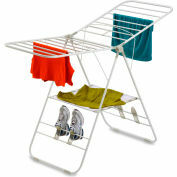 For indoor or occasional outdoor use, the rack is made from a coated steel frame making it sturdy and rust-resistant. 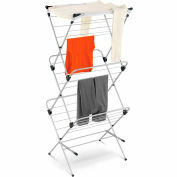 Unlike a wall-mounted unit, this portable rack can be used anywhere including; the laundry room, balcony, porch, bathroom, or kitchen and folds down to 2" flat for easy storing. 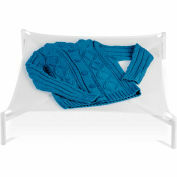 A top mesh shelf is ideal for air-drying delicate items such as sweaters, hosiery, and lingerie. 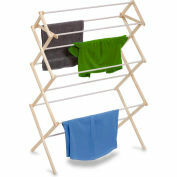 With an incredible 33-linear feet of capacity to air-dry clothes using minimal floor space, this expandable drying rack is a great space-saver.